Like most kids, I imagined on a regular basis what I wanted to be when I got older and had to begin life in the “Real World”. Whether it was a firefighter, actor, lawyer, ice cream shop owner (oh, just me? ), journalist, teacher, professional athlete, or coach; you imagined it and hoped it would become a reality one day. In about seventh grade, with four years of basketball under my belt I knew I wanted to try and make basketball my future and not just my present. I began thinking big picture. Could I play in college? Could I play professionally? If I can’t play forever, will I be good enough to coach? I know what you are thinking, ‘really in seventh grade you thought about all of this’? If you know anything about me, planning and goal setting is what I do. Maybe it’s the military background from my dad that instilled this way of thinking for me, but I am glad I have it. My time at Hartford went by extremely too fast. We won America East Championships and made the post season year after year! In addition, we beat Top 25 ranked opponents each of those years, including 5th ranked Duke my senior year; but I built relationships with great people and created lasting memories. After graduating in 2009, I was fortunate enough to spend two years playing professionally in Leimen, Germany. 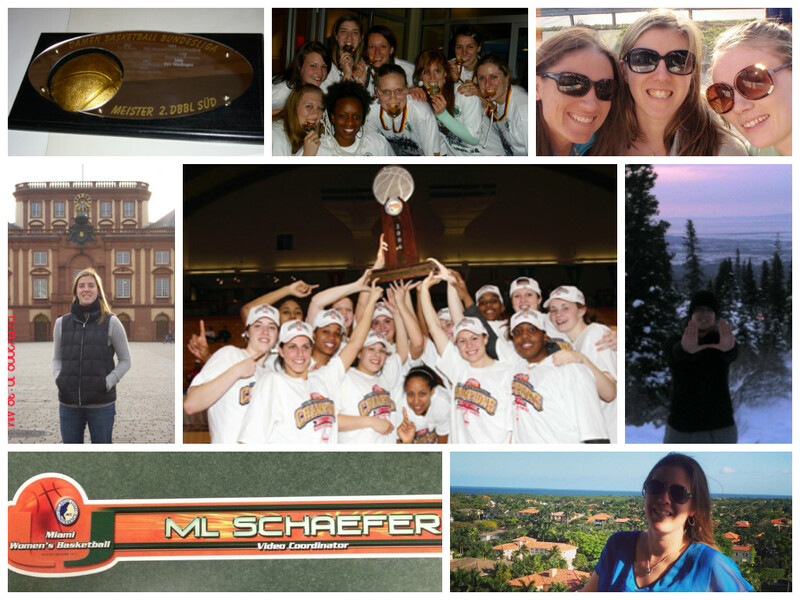 I won a championship, met amazing people, learned to speak another language and spent my last season playing with former college teammate and roommate, Katie Kelley. Living in another country and experiencing a completely different culture from what I grew up with, is something I will never forget. Here I am now, four years graduated and approximately 1,401 miles from Hartford and living in sunny Miami with a daily view of the ocean (unfortunately I am still working on that tan ... might be a lost cause, but I won’t give up). I am entering my third year working at the University of Miami and second year as their Video Coordinator. During my time on staff, we have traveled to Alaska, appeared in back-to-back NCAA tournaments, and watched seniors achieve their goals of getting drafted and competing in the WNBA and abroad. On a daily basis I am learning from an exceptional staff, led by Head Coach, Katie Meier. As a student-athlete I knew my coaches worked hard to prepare us for the upcoming season, practice, and opponent, but I didn’t truly learn to appreciate everything they did until I was on the same side as them. There is so much additional preparation and non-court related responsibilities coaches and staff have on a daily basis. I didn’t fully understand those responsibilities until I found myself doing some of those intangibles. Working at Miami has allowed me to learn unconditionally and appreciate how much work Coach Rizzotti and everyone else on the staff at Hartford did while I was there. In November, the 1,401 miles will shorten when Coach Rizzotti and the Hawks come down to compete in our Thanksgiving tournament. Not only do I look forward to their arrival, but hopefully Sully will be able to fit in a game of horse (like the ‘old’ days) when he isn’t found playing a few holes of golf. I would never change the path I have taken to what I am currently doing because at the end of the day I love working toward achieving what the seventh grade me set out to do.